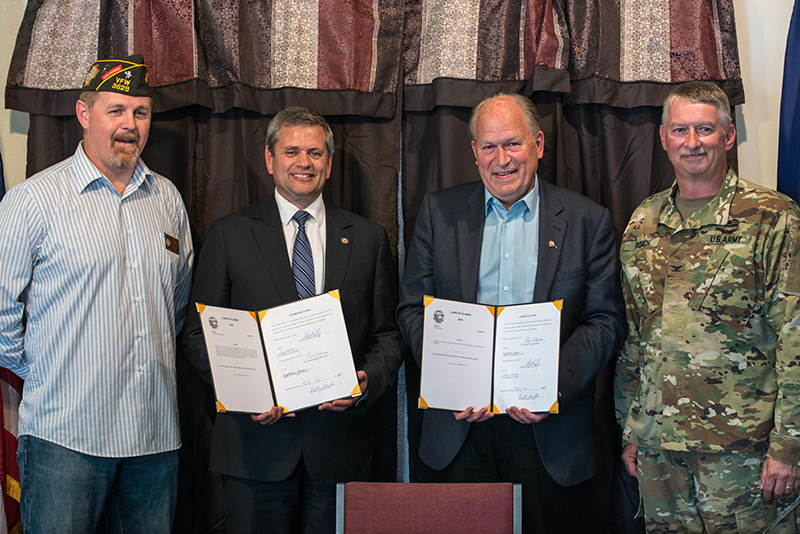 Fairbanks – A bill to expand job opportunities for veterans and members of the National Guard was signed into law today during a signing ceremony in Fairbanks. House Majority Leader Rep. Chris Tuck (D-Anchorage) sponsored House Bill 2 at the request of the United States Department of Defense, which has made it a priority to get legislation passed in all 50 states allowing private businesses to offer a military hiring preference. “The brave men and women in our military services are well trained and have skills that are highly sought after in the private sector. Frankly, I was surprised there was not already a hiring preference on the books. I was honored to sponsor this bill because it will help more of our veterans and National Guard members get good paying jobs here in Alaska. I am confident that businesses across the state will line up to quickly take advantage of this bill,” said Rep. Tuck. Every state offers a hiring preference to veterans and National Guard members for employment in the public sector, but private employers are precluded from offering a similar preference under the Civil Rights Act of 1964 unless the state passes authorizing legislation. HB 2 was the authorizing legislation for the State of Alaska. Alaska is now the 38th state to adopt legislation to give private employers the option of offering a veteran hiring preference. A 2012 survey found that two-thirds of veterans reported that the greatest challenge in transitioning to civilian life was finding a job. In 2016, the National Bureau of Labor Statistics released data indicating that the jobless rate among young male veterans exceeded the unemployment rate of their civilian counterparts. The U.S. military discharges 160,000 active duty service members and 110,000 reserve and National Guard members every year. The Defense Manpower Data Center reports that in 2015 over 2,000 military personnel returned to Alaska upon separation. Alaska is currently home to the highest number of veterans per capita in the nation. The Alaska House of Representatives passed House Bill 2 last year by a unanimous vote of 39-0. The Alaska State Senate unanimously passed the bill on May 12, which was the last day of the Second Session of the 30th Alaska State Legislature. Alaska Governor Bill Walker signed HB 2 into law today during a bill signing ceremony at the VFW Golden Heart Post 3629 in Fairbanks.